Luxury residences, world class facilities, and a prolific entertainment scene mark the Gold Coast as the lifestyle location of choice. Seeking a life well lived? In the late 1940’s, there wasn’t much more to the Town of the South Coast, as it was called back then, than a string of milk bars and beach shacks catering to the Australian and Allied Armed Forces on R&R during World War II. As its population grew, buildings spilled swiftly up and down the coastline until on May 16, 1959, it was proclaimed the City of the Gold Coast. While the name was used to describe the concurrent real estate boom, it was also fitting for the healthy way of life, golden sands and sunshine that it’s famous for. Many still travel to this famous coastal haven to holiday 50 years on, and is now affectionately known as home to more than half a million people all enjoying a better life, whatever that may mean to them, by the sea. Today, the Gold Coast’s glass towers are superimposed between glistening beaches and lush rolling hinterland. What was once just a coastal holiday town is now a thriving metropolis. A place to grow up, a place to raise your family, to explore the great outdoors, to get an education. A place to build your empire, or buy your dream home. A base for that next big adventure or somewhere to simply enjoy your golden years. The Gold Coast is an iconic tourist destination for a reason and while many travel from across the globe to experience it – the fortunate ones (like us) get to live it every day. Picture an easy commute to work. A classic pace of life that’s teeming with style. A seaside pad, a penthouse with a view or a hinterland hideaway that offers all the modern amenities of a big city. Look around and you’ll note that the Gold Coast doesn’t really have the same historic presence about it like that of a major city. Its charm is in its eclectic mix of architecture – where anything goes; the natural beauty it’s waterways and beaches afford; and the gentle, laid-back nature of the people that live here. 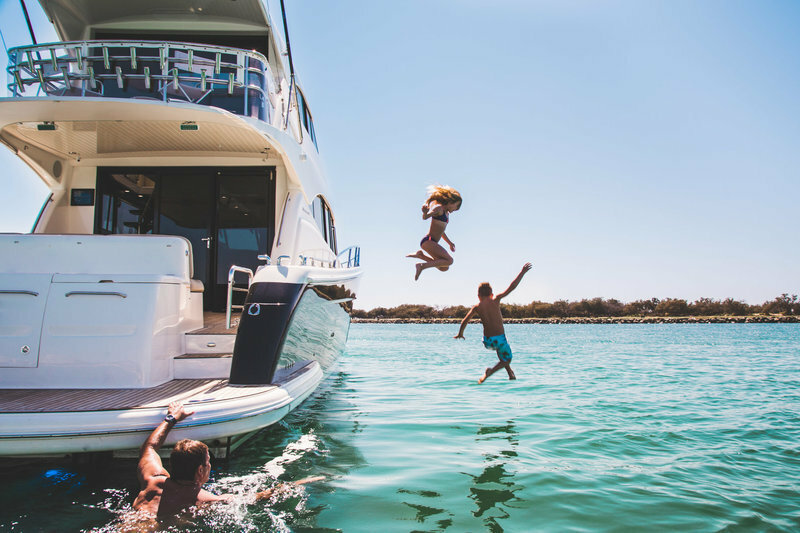 The views, the food, the company, the spaces, the waterways, the sunny days, and the rainy days – the Gold Coast’s enviable lifestyle never seems to disappoint. I grew up on the Gold Coast and Tony, a country boy at heart has lived here for much of his life. We’ve been spending a bit more time lately reflecting on what makes the Gold Coast such a big attraction for us. We love it here. The Gold Coast is our home and we can’t think of a better place to raise a family and grow old together. It’s funny what you uncover when you think about why you hold a place so dear to your heart. So here goes. The result of a lifetime spent chasing sunny days. 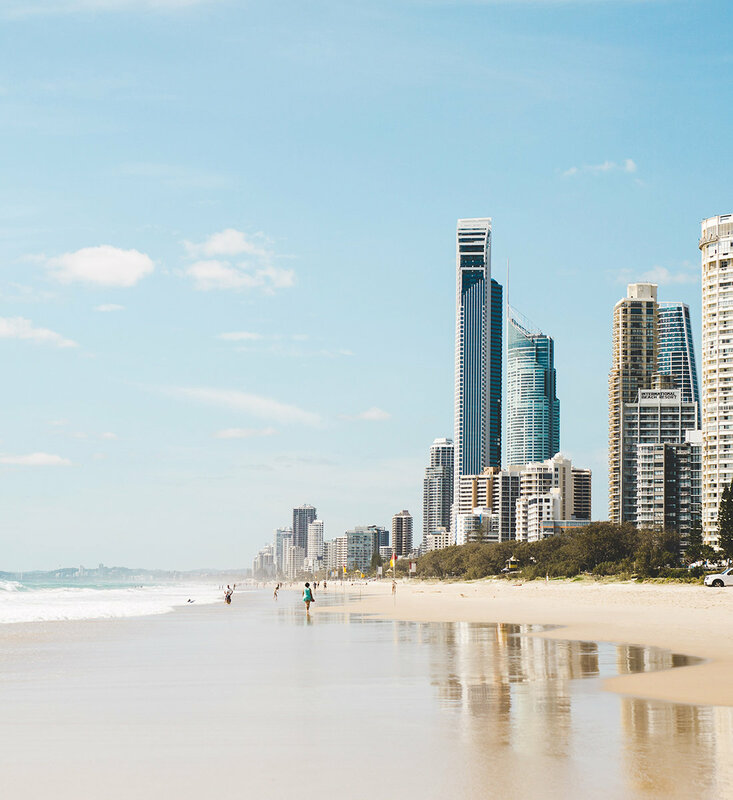 Here’s 8 reasons why we think the Gold Coast is the best place to live in the world. The thing I love most about the Gold Coast is getting to live by the water. We live on the Broadwater and I tell myself every day how grateful I am to wake up to that view – the calming water glistening in the early morning sunshine or the sound of the ocean as it gently breaks onto the shore. No matter where you are up or down the coast, you are practically 15 minutes or less from the deep blue waters and smell of the sea. That salty air and the cool sea breeze on the back of your neck on a hot summers day is so deeply ingrained in me. Waterways aside I think the other main reason I love the Gold Coast is because it’s wedged beneath some of our country’s most beautiful National Parks. Lush rolling fields and sub-tropical rainforest spills down the mountainside begging you to come and explore. As a child, some of my fondest memories are of the adventures we took out to Springbrook or Binna Burra on the weekends. We’d swim in the pure (freezing cold) mountain streams and play in the creek beds for hours. Today, getting back to nature regularly with my own family – hiking, exploring, lighting a fire and making toasties in the jaffle iron and settling in for a picnic, brings me so much joy. Honestly, if you haven’t taken the time to explore the wonders on our doorstep, you’re missing out. Sizzling summer days come to an end with tropical thunderstorms that roll out before the sun has even had a chance to set, leaving you to enjoy the clear balmy night that follows. The weather on the Gold Coast lends itself to the great outdoors all year round but my favourite season would have to be Spring. Sunny days, still a pleasant 24°c, and cooler nights to snuggle under the covers with loved ones. Ah. There is something about the freshness of the air at this time of year that brings renewed energy. The winter climate here is glorious too, perfect boating weather if you ask me. The air is dry, the water is like glass and the average temperature sits at around 20°c. Honestly. Officially they say the average water temperature at this time of year is 20°c but personally, I’d still be dragging out the full wetsuit before hitting the surf. Perhaps what makes the Gold Coast so special is just how open and friendly the people are. How many major cities can boast having such a down to earth culture and genuinely nice population? Generally speaking, the more urban you get the more jaded you get, but that sure isn’t the case on the Gold Coast. No matter where I go, I’m always greeted with a friendly smile and a welcome hello, out shopping, doing the school drop off, picking up the mail, it seems the local crowd are always up for a chat. Residents on the Gold Coast are well-educated, cultured, fit and outdoorsy people that care about the city. It’s as if the locals know their home is something special, and so everyone does their bit to keep it that way. When a city can offer both a work/life balance and a high paying job it becomes a very attractive place to bring up a family. I know Australia has a lot to offer in terms of family friendly cities, but when you look at the whole package, the Gold Coast is punching well above its weight across a number of areas. The first of which would have to be affordability. 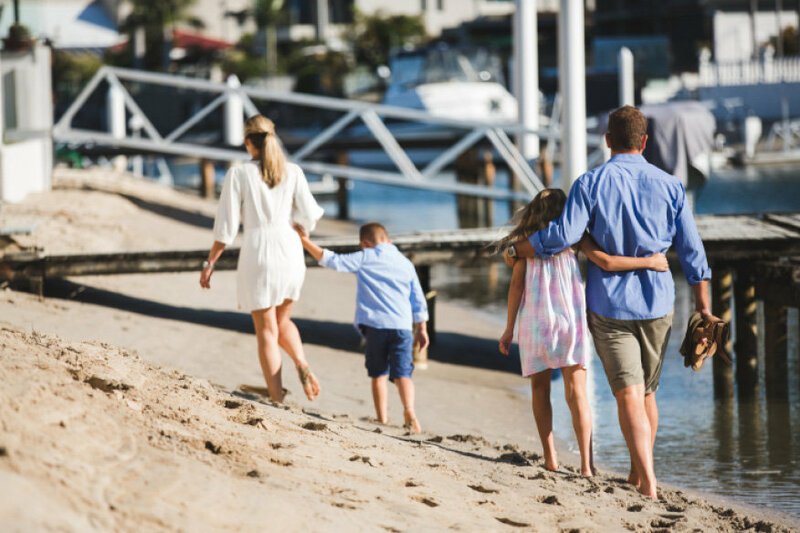 Regardless of what you earn, being able to live comfortably and within your means will set your family on the right path to enjoying the Gold Coast lifestyle. Imagine living in a waterfront home in a great location for under a million dollars – its the stuff dreams are made of. All parents share a common ground in that we want the best education we can afford for our children. The Gold Coast has a selection of high performing private schools, Catholic schools and state schools to choose from as well as three Universities. For the younger ones, there’s no shortage of great kindergarten or daycare centres if you’re looking to secure a place too. The Gold Coast is a safe place to live. Crime rates are low (contrary to what you might hear in the media). We have modern medical facilities, a new tertiary public hospital and a new private hospital right next door to it. A new private hospital has just opened in the health and knowledge precinct in Southport and there is also a good choice of smaller public and private hospitals as you head down the coast. Public transport is well planned; the roads are safe and the commute is easy. We have a proactive council working hard to maintain and develop our beautiful city and the facilities it affords – libraries, parks, playgrounds, community activities. The city is culturally diverse. You can enjoy a show or exhibition at the arts centre. Explore the many markets and street food precincts popping up all over the place. Local supermarkets and specialty food stores are easily accessible, scattered throughout the suburbs. We have a nurturing and competitive sporting community operating out of worldclass training facilities (thank you Commonwealth Games) and of course, the Gold Coast also serves up a huge selection of fun outdoor activities for everyone. Enjoy the theme parks all year round. Join a surf club and get the kids into nippers. Spend your days at the beach. Go paddle-boarding at Currumbin Creek. Drop a line in off your jetty or take the tinny out crabbing in the Broadwater. 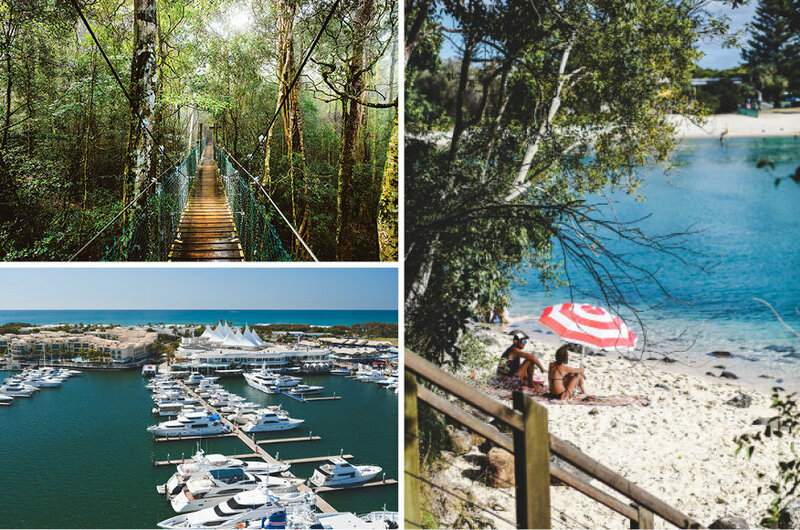 Explore the southern waterways or anchor up at Tipplers or Jumping Pin for the day. Go hiking in the hinterland or take the family bike riding along the foreshore. Seriously, I could go on. I grew up on the Gold Coast and I wouldn’t want to raise my family anywhere else in the world. Oh, did I mention the choice of two international airports for you to base your travels abroad from? Don’t feel like dressing up to go out for brunch? Who says you have to? Throw on a kaftan and thongs, grab your bag and go (and pack a towel and togs in case you have time for a quick swim while you’re out!). 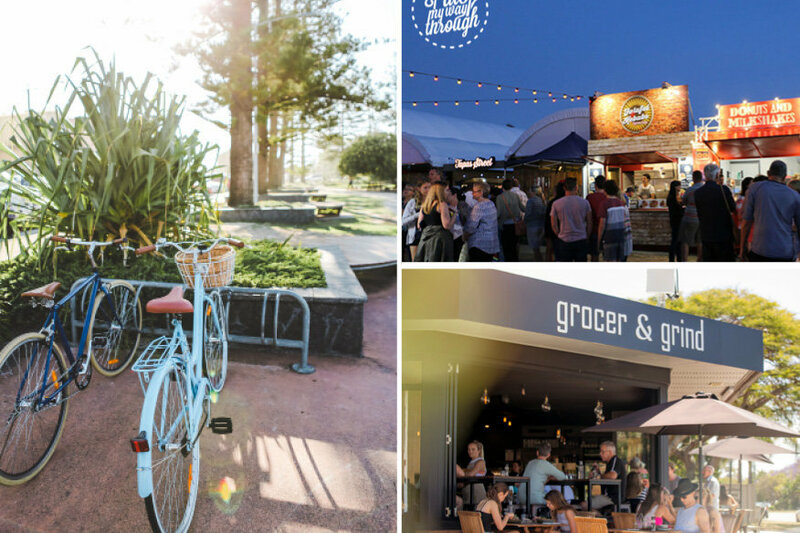 The Gold Coast is so laid back that anything goes and there are so many great coffee nooks to choose from up and down the coast. That said, when you do want to dress up and hit the town you can. You’ll find many classy bars, hip eateries and fine dining restaurants at Burleigh, Nobby’s, Mermaid and Broadbeach. If you’re on the northern end of the coast there’s a few worth dropping into at Marina Mirage, Paradise Point, Hope Island and Sanctuary Cove too. 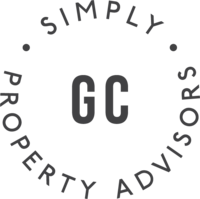 The city’s highly desirable location, lower average wages, and affordable property market make the Gold Coast a great place to base a business. Look to the skies and you’ll quickly see how fast the Gold Coast is growing. The cranes may be back in a big way, but it’s the sheer number of businesses and the depth of the economy that makes the city such an attractive place to invest or set up shop. While the Gold Coast is not yet established as a business location like other major cities, it does have significant potential for growth. An increase in population will bring an increase in the demand for services making the Gold Coast fertile ground for new entrepreneurs and small to medium enterprises to capitalise on. The Gold Coast is also becoming a centre of excellence for skilled labour, thanks to an influential university sector that is building a knowledge base in the region that will boost the business sector going forward. There is so much opportunity for entrepreneurs and dynamic small businesses to excel within the Gold Coast’s growing business community. If you have something valuable to offer the city – we need you. And we want you. It’s time to step up to a better life. Brisbane City is less than an hour away. That means big city perks without the rush hour. Catch a headlining show at the theatre, see your favourite rock band live in concert, or depending on the season, get your live sporting fix at the footie, cricket or tennis. Can’t find the perfect outfit, homewares or piece of furniture? No worries, head into the city for a day of shopping, it’s that easy! What do you love about the Gold Coast? If you’re local, why do you live here? If you’re longing to join the neighbourhood, tell us why? What’s important to you when you considering where you want to live?